Patagonia has announced the launch of their Worn Wear online store, which offers previously-owned Patagonia items at a lower price. 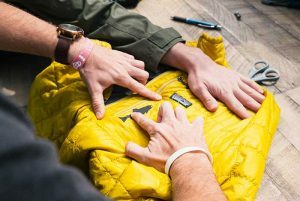 Patagonia’s Worn Wear online store is a place where customers can buy previously-owned Patagonia gear at a lower price point, giving it a second life. With products sourced directly from Patagonia customers in exchange for merchandise credit, the Worn Wear online store aims to provide simple new ways to extend the life of high-quality gear while also proving that investing in the circular economy makes good business sense. The need for businesses to step up and address the effects of climate change has never been greater. The global apparel market is worth $3 trillion, but unfortunately the low cost of manufacturing and the relentless drive for profits above all else has driven many companies to offer cheap, throwaway clothing rather than build high-quality gear built to last. Worn Wear seeks to help reverse this trend by highlighting the value of investing in high-quality products, providing the tools required for long-term ownership and by providing a platform for resale of used goods. Patagonia is proud to lead a growing number of organizations committed to furthering the circular economy business model.